Bronwen Dickey and her husband adopted a dog from their local shelter, and afterwards were told that she looked like a "pit bull." 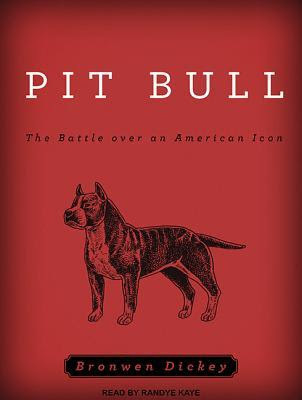 Dickey looked at the scary pit bull stories, and her sweet pet, and got very interested in the history of the pit bull. It's a story that encompasses bull dogs and terriers, fighting dogs, American military dogs, and working farm dogs. It includes some of the biggest early canine stars of the silver screen, and dogs who scramble for survival with their human companions on the mean streets of the inner cities. It includes the "game bred" dogs of those who love the heritage but would never fight their own dogs, and the softer, easier dogs of those who love the look and the strength but see the "game bred" spirit as something best left to history. And it includes not only the American Pit Bull Terrier (registered with the United Kennel Club) and the American Staffordshire Terrier (the American Kennel Club's version of the same dog), the Staffordshire Terrier, the Staffordshire Bull Terrier, and several other breeds that may or may not be called "put bulls" by one authority or another, but a wide range of mixed breed dogs that look like one or more of these breeds and may or may not be crosses or mixes of them. That's part of the challenge and terror of loving these dogs. They are so often banned, and in some places seized and killed, and usually the only determiner of whether or not your dog is "a pit bull" is your landlord or your neighbors or your local animal control officer who has no more training in visual identification of breeds than your landlord or your neighbors have. Your dog who has never so much as growled at anyone can suddenly be on trial for her life for having a short coat and a broad head. Dickey interviewed those who love the American Pit Bull Terrier as recognized by the UKC, and those who love all the "pit bull" mixed breed dogs in shelters or owned by inner city residents most often targeted by "dangerous dog" laws. She talked to those who've done extensive research on dog bites and dog behavior, and those who reject the research as being the product of "the pit bull lobby," a shadowy, sinister perceived presence allegedly bent on keeping dangerous dogs on the streets. It's a fascinating journey through the history of an American breed type, and Randye Kaye does an excellent job of narration.